An issue of al-Kown dated May 6, 1909. 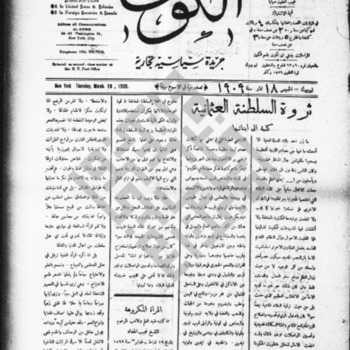 An issue of al-Kown dated January 14, 1909. An issue of al-Kown dated December 16, 1909. An issue of al-Kown dated November 18, 1909. An issue of al-Kown dated November 11, 1909. An issue of al-Kown dated October 28, 1909. An issue of al-Kown dated September 23, 1909. An issue of al-Kown dated September 16, 1909. An issue of al-Kown dated September 2, 1909. An issue of al-Kown dated July 29, 1909. An issue of al-Kown dated June 17, 1909. An issue of al-Kown dated April 29, 1909. An issue of al-Kown dated April 22, 1909. An issue of al-Kown dated April 15, 1909. An issue of al-Kown dated April 1, 1909. An issue of al-Kown dated March 25, 1909. An issue of al-Kown dated March 18, 1909.